We’ve been experiencing cold and rainy spells in New York lately, and although Spring has arrived, it has been quite gloomy. Having hotpot for dinner seemed like the best idea: to relax, savor our food, and have warm tummies at the end of the evening. I love eating hotpot in large groups because it brings people together around the table; we can talk about our week while working for our food, and just take our time eating, socializing, and enjoying each other’s company. It’s equally wonderful when it’s just you and your hubby because it’s intimate and special (we don’t have hotpot nearly enough! 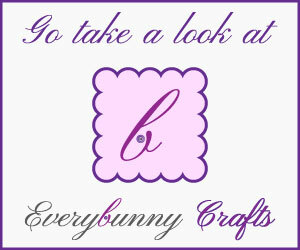 ), but it isn’t overly formal. 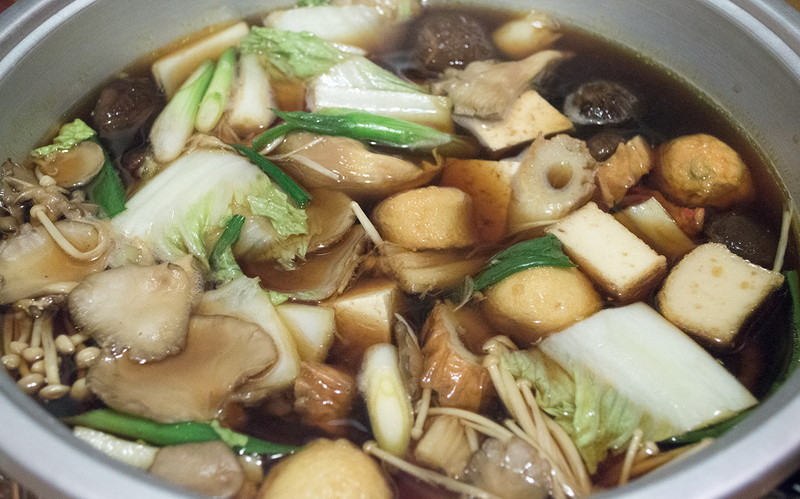 There are an infinite number of choices for nabemono (鍋物 – nabe, or *cooking things in a pot*), but we decided on an oden (おでん) broth with additional meats and vegetables. In the hotpot bowl, mix together the HonDashi with water. Add the rest of the oden broth ingredients and mix. Place the bowl onto the electric hotpot heater. Throw in the dried shiitake and turn on the electric burner so the liquid comes to a simmer. Cover with the lid. 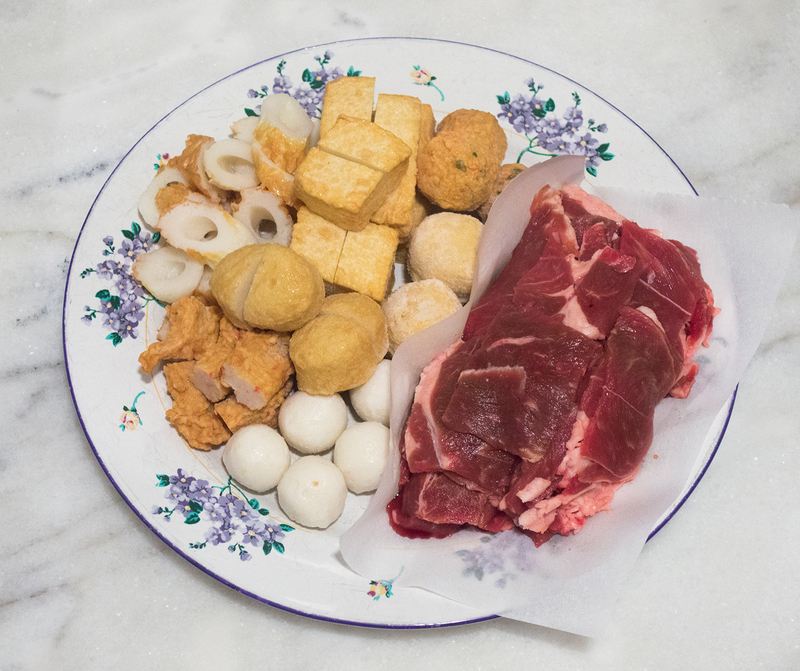 While the soup is simmering, cut up the lamb/beef, fishcake, mushrooms, cabbage, scallions, and tofu into edible portions, for easy dipping and eating. 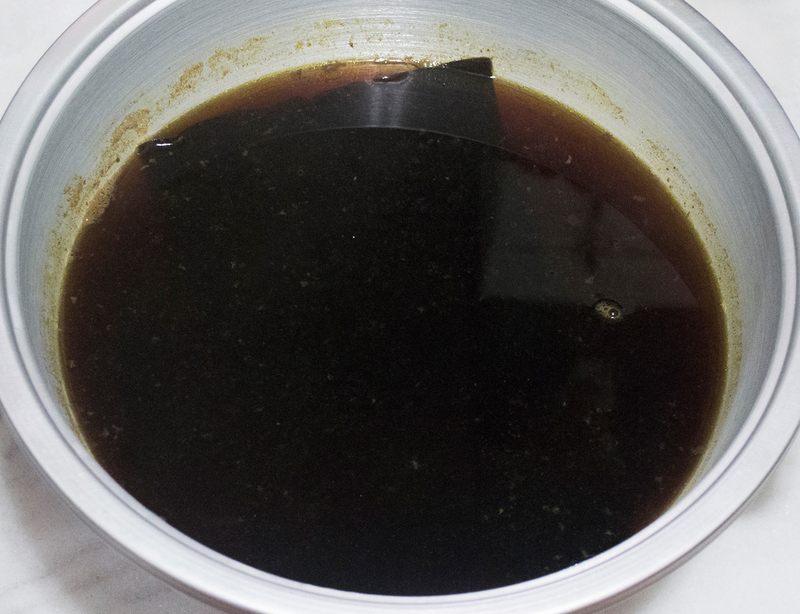 Once the liquid begins to simmer, fish out the kombu and begin adding the desired amount of meat and vegetables. You can add all of the ingredients at once, or take your time adding each ingredient. After the meat and vegetables are cooked, they can be immediately served into bowls, or fished out individually at each mouthful. Enjoy with the dipping sauce. 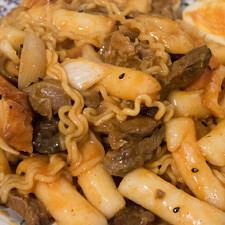 Nabemono (鍋物) is very versatile. 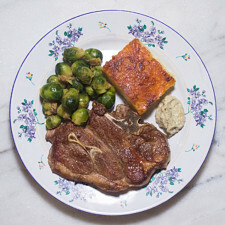 Your meats and vegetables can be anything you want it to be. Feel free to add seafood, thin cuts of meat, or other vegetables (e.g. leek, spinach, bok choy, etc.) to help flavor the hotpot. Kombu (昆布) is a kind of kelp. I use the dried kind here. The white coating you find on this seaweed is normal. Don't remove it, because that is what gives the dashi flavor. Just give the kelp a quick rinse under cold water before using. 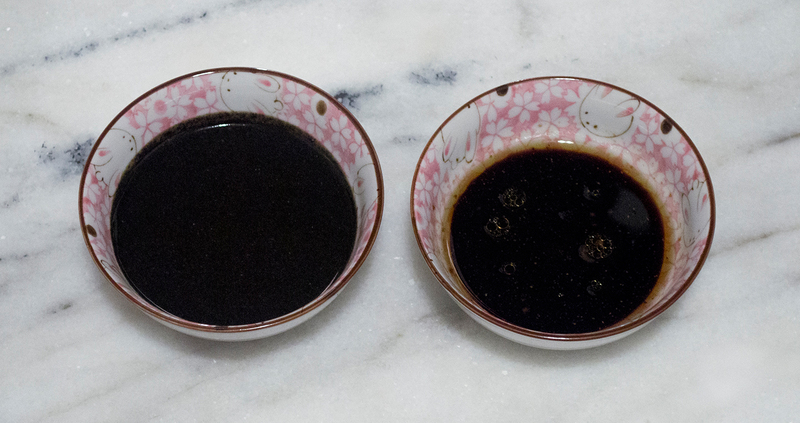 Dashi (出汁) can be easily made from scratch. For a quart (about a liter) of water, simmer a palm-size piece of kombu, a couple of dried shiitake mushrooms, and a handful of dried shaved bonito (鰹節, かつおぶし - katsuobushi) for 10 minutes. Cover, turn off the flame, and let it sit for 15 minutes. Strain the large pieces and use the dashi for all of your Japanese recipes. I use dashi powder to make my soup base because it's convenient. You are welcome to use up to 1t per 2 cups of water for additional umami flavor. In this case, we have other meats and vegetables flavoring the soup, so I'm only using ¼-½t for 2 cups (Remember that I've added the kombu and the dried shiitake to the hotpot as well, but these only bring more depth to the broth; if you don't have kelp or dried mushrooms, you can omit them.). 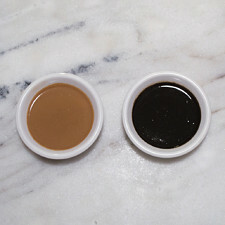 The sesame sauce, or gomadare, is just one kind of dipping sauce, but definitely one of our favorites! The joy of eating hotpot is that we can cook just a few pieces of meat and vegetables at a time, and savor the food and conversation. 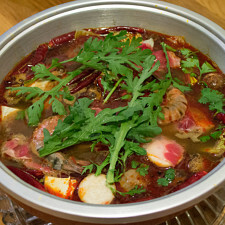 Made our Recipe for Nabemono (鍋物) - Nabe Hotpot? 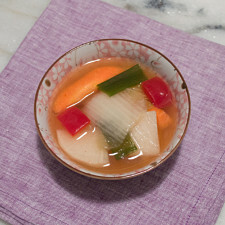 Here is the oden broth. Gomadare with black sesame seeds, and a soy-vinegar-garlic dipping sauce. Plate of assorted fishcakes and sliced lamb. 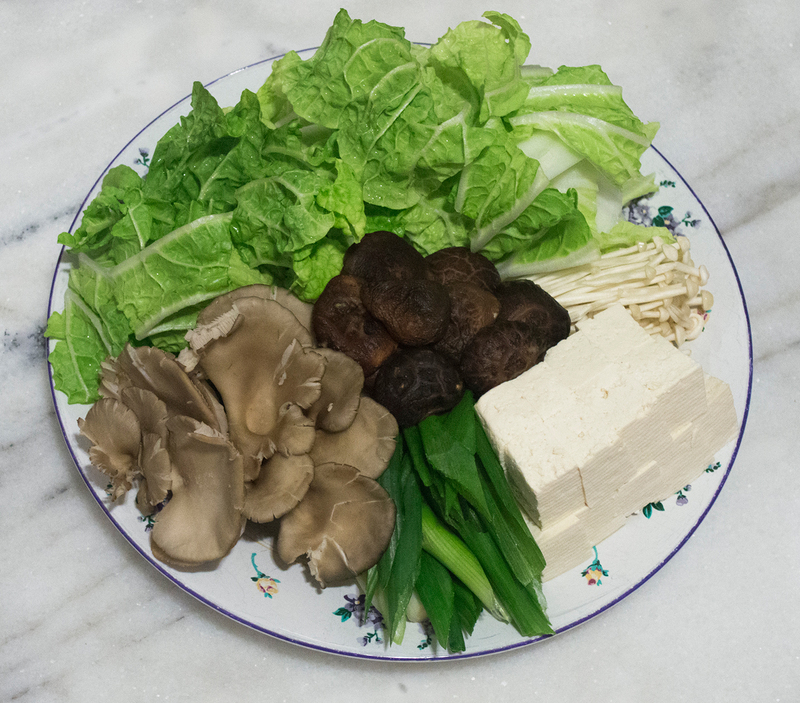 No thoughts on "Nabemono (鍋物) – Nabe Hotpot Recipe."